The night sky this time of year at 6 p.m. local time from mid-northern latitudes. But more importantly, these Cepheid stars are powerful tools in gauging distances to other galaxies. Harvard Observatory astronomer Henrietta S. Leavitt (1868-1921) discovered in 1912, that there's a close relationship between the period and intrinsic brightness of a Cepheid - the longer the period, the greater the star's luminosity. An astronomer need only determine a Cepheid's period and apparent magnitude. The former value then gives us the star's absolute magnitude; by comparing its apparent and absolute magnitudes it is then easy to calculate the star's distance, which in turn gives the distance of the galaxy in which it is located. One is Mu Cephei, better known as William Herschel's Garnet Star. With careful scrutiny, its ruddy cast is apparent even to the unaided eye on a dark night and it is stunning in good binoculars. Another binocular attraction is the Milky Way. 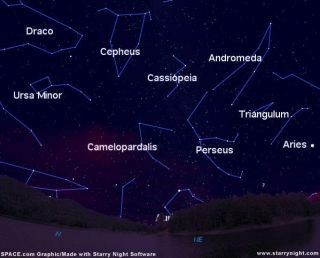 You'll enjoy sweeping the Cepheus region on dark nights. An amazing profusion of celestial treasure passes in review before you - star trains and clusters, highly tinted single, double and multiple stars, and even hints of faintly glowing nebulosity and dark obscuring clouds of gas and dust. This rich treasure trove seems fitting for the dim, misty countenance of King Cepheus. Might we then imagine the Milky Way's as his flowing royal gown woven out of stardust?